“Are we ever gonna be better than this?” Zac Efron’s Cole Carter shouts in the electric climax of We Are Your Friends. I hope, for his sake and ours, the answer is yes. We Are Your Friends opened a week ago, staking its place as one of the biggest flops in wide-release history. How did this happen? How did a movie about EDM starring Zac Efron and featuring the line “I was reading about the guy who invented Instagram” manage to fail? It had potential to be hokey, good fun, or at least hokey bad fun, but it couldn’t manage either. Efron should have been the saving grace of this film. 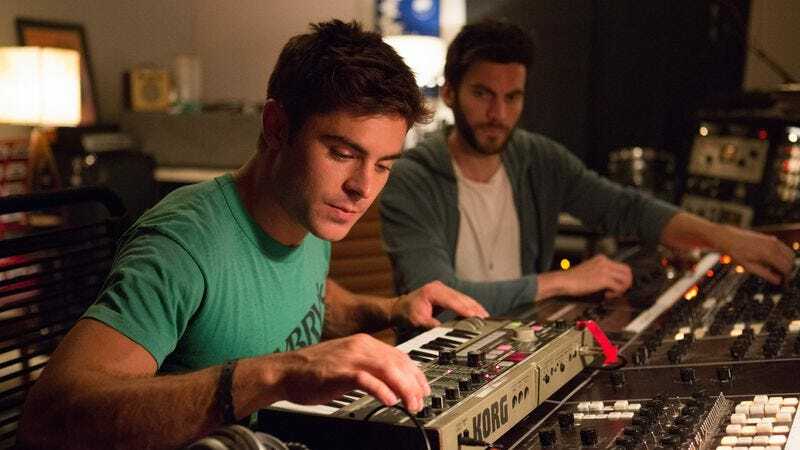 It’s not as if true EDM fans would be going to We Are Your Friends in droves, but Efron at least has box-office appeal that could have salvaged it. He has a definitive fanbase. The failure of the film, however, goes beyond the fact that Efron’s Cole is wildly underwritten; a charismatic-enough performer can save an underwritten part. (Look no further than Bill Hader in Trainwreck.) Efron couldn’t save We Are Your Friends because he’s not a leading man. The longer we convince this guy he’s the hero he’s marketed to be, the more we’re doing him a disservice. He’s a character actor with a leading-man’s face whose best character is a variation on Zac Efron the adult actor. And that’s fine. That’s what he should be. Efron’s background is in theater—specifically, as everyone knows, musical theater. He’s a larger-than-life performer, clear from his Disney background, but he’s also a deeply generous one. It’s possible that his two best film performances have already occurred: Hairspray (2007) and 17 Again (2009). As teen Efron, he was able to maintain his boyish exuberance and zaniness. He can thrive outside of the Disney Channel. It was his transition, however, into the world of being an adult on-screen that has led to something of an identity crisis. Efron’s lead performances prior to We Are Your Friends are equally lackluster and disappointing. He took on starring (or almost starring) roles in films like The Lucky One, The Paperboy, and At Any Price. Those films are all disasters in their own ways. The Lucky One and At Any Price feature Efron as a brooding romantic lead. He’s got nothing to give but smoldering gazes and abs; he provides a minimum amount of charisma to keep both films afloat, but not much beyond that. The Paperboy eats Efron alive. He has some nice back and forth with Matthew McConaughey, but that’s about it. Nicole Kidman and John Cusack and David Oyelowo are all playing characters in The Paperboy, and Efron is just there. He’s barely present as the film moves around him. Being a leading man goes beyond being handsome and charismatic, which is where the disconnect seems to occur for Efron. A leading man always has to be something of an everyman; you have to be able to connect to the struggle. It’s difficult to watch Efron be a handsome young DJ and think, “Yeah, this represents my story.” That’s not to say a leading man shouldn’t be handsome and young—most of them are. Efron simply can’t portray the everyman struggle because he isn’t an everyman. In his lead roles, he never starts at the bottom and works his way up. He doesn’t hustle. He starts somewhere in the middle, never convincing us that he stands a chance to fail, and despite a healthy amount of charisma, Efron can’t carry these performances out. We Are Your Friends is also a curious blip on the Efron radar as he’s rebuilt his image over the past year and a half. It’s easy to think that he’s best suited to comedy. His two big films of 2014, That Awkward Moment and Neighbors, were both comedies. Neighbors was widely considered the rebirth of Efron: His performance was critically lauded (and rightfully so) for how obnoxious and funny and almost frightening it was. As Teddy Sanders, Efron took every part of his pre-existing pretty-boy persona and put it on blast. Efron is essential to Neighbors because he makes the Seth Rogen man-child archetype seem normal; he’s the reflective surface in which Rogen’s character sees his own youth disappear before his eyes. Efron is allowed to be boisterous and loud and dark and occasionally scary. He can’t be the straight man, so he doesn’t try, and in turn, he gives that movie the edge it needs. Those under the assumption that Efron can’t handle a dramatic role should look twice at his performance in Neighbors. It’s Efron leaning so far into his own persona that the result is nightmarishly effective. But comedy is not necessarily Efron’s saving grace. He’s not a breakout comedic actor in the way that Channing Tatum was following 21 Jump Street. Months before the release of Neighbors, That Awkward Moment saw Efron flounder as a comedic romantic lead. In that film, Efron’s Jason falls somewhere in the middle of the Bro Spectrum, not quite as sleazy as Miles Teller’s Daniel nor quite as sensitive as Michael B. Jordan’s Mikey. Efron is meant to be the moral anchor of the film, but he fades right into the background of it. When Efron is in the spotlight—and when he knows he’s in the spotlight—he shrinks. He seems to feel obligated to be subtle and nuanced, because that’s what a normal person is, but Efron has no idea what a normal person is like. He’s been famous since he was a teenager. It’s difficult for an audience to root for him and a girl because we never doubt that he will pull it off. Perhaps one of the most interesting and crucial footnotes in Efron’s career is his bit part in Josh Radnor’s Liberal Arts. Imagine, Zac Efron in a bit part! His role is bigger than a cameo, but not significant enough to warrant a mention in the opening credits. It’s not a “with Zac Efron”; it’s a “wait, is that Zac Efron?” It’s a complete surprise. Efron plays Nat, a prototypical stoner with a tassled hat and squinty eyes. Radnor’s Jesse befriends Nat in the loosest sense of the verb, mainly sitting with him on the quad and listening to Nat spout off nonsensical philosophies. The whole thing is baffling, with Jesse going so far as to say, “I’m not even sure you’re real.” (Nat replies, with pitch-perfect chill, “It’s all true, brother.”) To say Zac Efron saves Radnor’s film is saying a lot, but he does. The performance is profoundly over the top, far removed from any other Efron role, but it’s everything that the much-too-serious Liberal Arts needs to avoid becoming a parody of itself. The best choice Radnor makes as a director is to cast a widely recognizable young actor and give him the least subtle cameo of all time. So what do we do with him? Where does Efron go from here? Are we ever gonna be better than this? His 2016 IMDB credits show only comedies going forward—a combination of both lead and supporting roles. It’s not bad seeing Efron continue down a comedic path, and it’s not bad seeing him lean into these frattier roles. He’s got to embrace everything about his persona that audiences know, and then he’s got to blow it up. He’s a caricature, but there’s a place for that, too. Efron oozes charm and talent when we’re not required to root for him. Audiences want to see him—some people did see We Are Your Friends, and they almost definitely didn’t see it for the EDM—but when audiences want to see Efron, they want to see him and not themselves. Being an adult performer doesn’t mean Efron needs to tone it down. It’s the opposite: He’s got to kick it up a few notches. He’s got to show just how loud and boisterous and ridiculous he can be. He’s a caricature of himself, which is fine, because that’s how we like him.